Following a bumper entry of 50 designs from small architecture practices across the country the Our Island Home Design Competition award was presented today by Richard Lochhead, Cabinet Secretary for Rural Affairs and the Environment at the Rural Housing Scotland Conference in Birnam. The competition sponsored by the Prince’s Countryside Fund, Highlands + Islands Enterprise, Scottish Sea Farms, UPM Tilhill and BSW Timber Group asked architects to design an affordable 2 bedroom starter home suitable for the Hebrides that is easy to build and cheap to heat for under a challenging budget of £100,000. From a shortlist of six projects – described by the Chair of the Judging Panel, Lesley Riddoch as “inspiring, practical, green and quite ingenious” , the judging panel selected a design by Tom Morton of Arc Architects, from Cupar as the winner. Tom’s island home design was deemed ‘the most thoughtful submission’ by the judging panel The design features that aided its success in the competition were its low environmental impact, simple construction and aesthetic approach. It was important for the design to meet the vernacular of island life and Arc’s design made sure there was a porch for wellies, a larder and a shed outside. “I was impressed by the standard of designs submitted and congratulate (name of winner). Housing is and will remain a priority for this Government and we will continue to invest in new affordable homes, which are particularly needed in rural areas. Photo of the winner (Tom Morton) with Richard Lochhead, Lesley Riddoch and the shortlisted architects. The Our Island Home competition aims to deliver a 2 bedroom house for less than £100,000 and Rural Housing Scotland will work with community landowners in the islands to find sites and funds to build the winning design. It is expected that the winning design will be used by community landowners, self builders and housing associations. Our Island Home is based on the Isle of Mull and works across the Hebrides from Islay to Lewis. 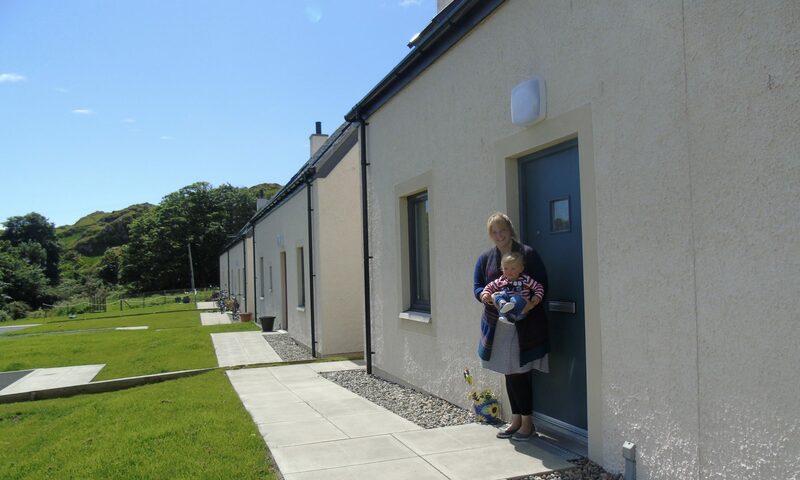 Our Island Home is a project of Rural Housing Scotland, the trading name of Rural Housing Service. Rural Housing Service is recognised by OSCR, Scottish Charity No. SC 031239 and is a Company Limited by Guarantee SC 216096.